CSS successfully initiated, forged, and promoted an innovative partnership for the design, construction, and operations and maintenance (O&M) of a world-class research facility at the John F. Kennedy Space Center. We developed the initial business plan that resulted in a Federal-state partnership to create the 106,000 sq.ft. 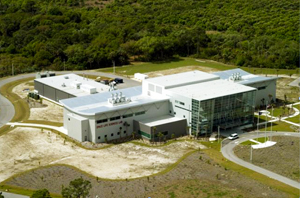 laboratory complex and adjacent 420-acre International Space Research Park; provided technical support to the design teams and coordinated the development of laboratory requirements documents; and served as the facility O&M contractor post-construction. The SLSL facility features analytical chemistry, tissue culture, molecular biology, physics, and materials processing laboratories; AAALAC accredited Biosafety Level 2 animal care facilities; controlled environmental and plant growth chambers; International Space Station (ISS) experiment fabrication and test facilities; and supporting storage, office, and conference rooms. As part of our O&M services, we provide maintenance of all facility systems, equipment calibration, security, waste management, and janitorial and landscape services. We also operate the building data network system, which supports open network services, high-security network services, and voice-over IP phones. The SLSL has been listed as an ISS-National Laboratory ground-based asset and now serves as the headquarters of the Center for the Advancement of Science in Space (CASIS), which manages the science for the ISS- National Lab elements. The President & COO of CSS received NASA's Public Service Medal (the highest honor NASA can bestow on a contractor employee) for his contribution to the SLSL.